Peggy Walton was 81 when she was diagnosed with Vascular Dementia in 1997 shortly after going to live with her daughter’s family in Ewhurst Green, East Sussex. The condition, the UK’s second most common type of dementia after Alzheimer’s disease, is caused by problems affecting the supply of blood to the brain. Mrs Hewer said “people then spoke about dementia in hushed tones – they were frightened by it,” and described seeing her mother battle the disease as “absolutely surreal” and “very distressing”. Peggy started going missing from her home and experienced violent mood swings; Mrs Hewer’s “normally placid” mother had become “violent and aggressive”. “It became obvious that she couldn’t be left alone for long and so I left my job in retail management to care for her,” added Mrs Hewer. There were also a number of psychotic incidents. Mrs Hewer said it was a very difficult period, especially for her husband Mike, but he was very patient and caring and they managed to cope. However, there came a point when her mother “no longer knew that I was her daughter and this was a terrible time for me”. 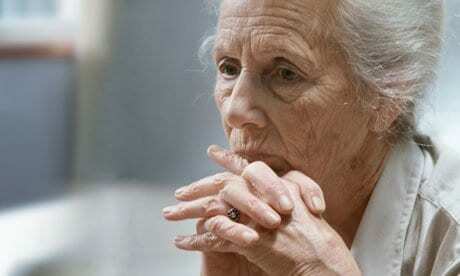 Peggy eventually became incapable of doing anything for herself and was in need of 24-hour care. She did not sleep for more than 30 minutes at a time, and became incontinent. Mrs Hewer said for the last few months of her life Peggy lived in a nearby care home where the staff did a wonderful job in looking after her, but the experience for the family was “heart-breaking”. She died in March 2005, the day after her 89th birthday. Mrs Hewer says she was shocked by the new figures from the Office for National Statistics “but not entirely surprised because the reporting of dementia has improved”. The symptoms of dementia, she said, were not so easily understood at the time her mother was suffering. Since then Mrs Hewer has raised more than £50,000 for Alzheimer’s Research UK in memory of her mother by running more than 100 marathons. She became first person to knit and crochet while running a marathon – achievements marked by Guinness World Records – and has a blog, Extreme Knitting Redhead, on which she records her efforts and thoughts about dementia. “It was a horrendous experience for us – none of it made sense at all,” added Mrs Hewer.